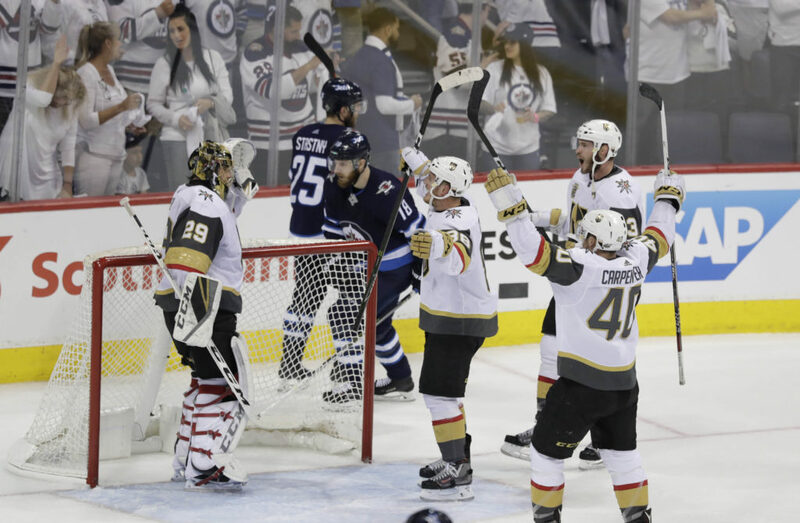 An expansion team — the Vegas Golden Knights — has made the Stanley Cup Finals against Alex Ovechkin and the Washington Capitals. I tried to say that matter-of-factly. It’s mind-boggling. Don’t let anyone tell you that it isn’t. Or if they do, tell them to knock it off. What’s next? Elvis entering the building to sing the national anthem and confessing that he had been hiding out in the Graceland basement for the past 41 years? And that he’s always been a Marc-Andre Fleury fan? The only thing aggravating about this has been the attempts of those conditioned to be contrarian, contrive controversy and concoct conspiracy theories to portray this as some sort of embarrassing negative for the NHL. And it has been hard to hear those who in bursts of selective memory try to tell us they saw this coming, perhaps citing tortuous, 20-20 hindsight about the conditions of the first expansion draft in the league’s salary cap era. OK, maybe it should be embarrassing to the other teams. Case in point: How does William Karlsson go from scoring 15 goals in two seasons with the Blue Jackets to pouring in 43 in the Golden Knights’ inaugural season? Maybe it’s because once the NHL decides what players are, and plugs them into niches, it can be difficult to break out … short of a completely fresh start. Look at how enthusiastically trumpeted the Avalanche’s improvement from 48 to 95 points as if it was darned near worthy of a parade. How do you explain a team with pockets of elite talent, the Dallas Stars, again not even making the playoffs? And here are the Golden Knights in the Finals after an amazing regular season that shows this is no fluke, not just a product of a hot goaltender stealing not just games, bit also rounds. When Patrick Roy did that for the Canadiens in 1993, nobody discounted the Habs’ worthiness. Fleury has been terrific, but not to the point that this will go down as a Cup solely stolen by a goaltender with his teammates as gritty accomplices. Fact is, I’m like almost everybody else. When the Golden Knights got off to a good start, I thought it was a nice little story. Amid the excitement and the glitz and the glamor of a major-league sports franchise landing in Las Vegas, the Golden Knights fooled those of us expecting them to struggle from the start. Fleury’s presence couldn’t fend off the inevitabilities. Then, with rare exceptions, the Knights just kept on going. Again, the most amazing thing about this isn’t that an expansion team has made the Finals, it’s that an expansion team didn’t rely on playoff magic to make the Finals. This isn’t the eighth-seeded Kings awakening in the postseason. This is one of the best teams in the league kicking it up a notch in the postseason. The wall they were supposed to hit never got constructed. Or it kept moving back. And now they’re in the Finals. They’re in the Finals against a team seeking to erase the years of postseason disappointment, trying to give Ovechkin the opportunity to finally raise the Cup. This is not Ray Bourque territory, but similar enough so that even those watching without a rooting interest could be gratified to see it happen. Terry Frei of the Greeley Tribune writes two commentaries a week for Mile High Sports. He has been named a state’s sports writer of the year seven times, four times in Colorado (including for 2015 and 2016) and three times in Oregon. He’s the author of seven books, including “Horns, Hogs and Nixon Coming,” and “’77: Denver, the Broncos, and a Coming of Age.” His web site is terryfrei.com. His additional “On the Colorado Scene” commentaries are here and his Greeley Tribune columns and major features can be accessed here.